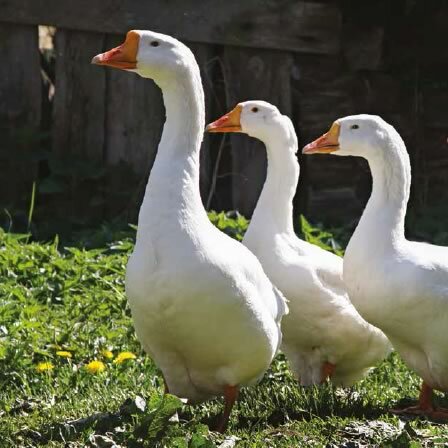 Geese have been domesticated for at least 4,000 years, with the earliest examples being found in ancient Egypt. They also feature in Greek Mythology, such as in the story of Aphrodite who was met by the Charites, whose chariots were drawn by flocks of geese. Geese are perhaps best known for their ‘honking’, making them excellent guard dogs, in addition to their use for meat and eggs. Goose eggs are increasingly popular, tasting similar to chicken eggs but with a richer and gamier taste. They are also at least twice the size!